[116 Pages Report] The global automatic feeding market was valued at USD 4.08 Billion in 2016 and is projected to grow at a CAGR of 7.5% from 2017, to reach USD 6.30 Billion by 2022. The objectives of the report are to define, segment, and estimate the size of the global automatic feeding market, in both quantitative and qualitative terms. Furthermore, the market has been segmented on the basis of feeding line, individual feeding equipment, livestock, feed, and region. The report also aims to provide detailed information about the crucial factors influencing the growth of the market, strategical analysis of micro markets, opportunities for stakeholders, details of the competitive landscape, and profiles of the key players, with respect to their market share and competencies. This research study involved the extensive use of secondary sources (which included directories and databases) such as Forbes, Bloomberg Businessweek, and Factiva to identify & collect information useful for this technical, market-oriented, and commercial study of the automatic feeding market. The primary sources that have been involved include industry experts from core & related industries and preferred suppliers, dealers, manufacturers, alliances, standards & certification organizations from companies, and organizations related to all segments of this industry’s value chain. 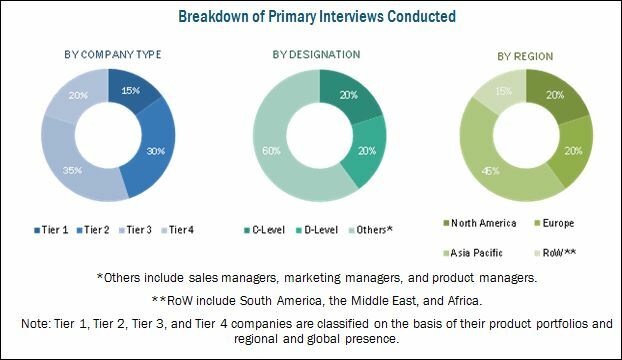 In-depth interviews have been conducted with various primary respondents, such as key industry participants, subject matter experts, C-level executives of key market players, and industry consultants, to obtain and verify critical qualitative & quantitative information as well as to assess future prospects. The following figure depicts the market research methodology applied in drafting this report on the automatic feeding market. The key manufacturers in the automatic feeding market include AGCO Corporation (US), Delaval Holding (Sweden), GEA (Germany), Big Dutchman (US), Kuhn (France), Trioliet B.V. (Netherlands), and Lely Holding SARL (Netherlands). These companies have diversified product portfolios and advance feeding technologies at major strategic locations. The other companies which are profiled include VDL Agrotech (Netherlands), Pellon Group OY (Finland), Rovibec Agrisolutions (Canada), Coromall AS (Denmark), and ROXELL (Belgium). This research report categorizes the automatic feeding market based on feeding line, individual feeding equipment, livestock, feed, and region. Further breakdown of automatic feeding into equine feeders, cow feeders, and waterers. Further breakdown of the Rest of Europe automatic feeding market into Switzerland, Denmark, the Netherlands, and Poland. Further breakdown of the Rest of Asia Pacific automatic feeding market into Indonesia, Singapore, and Thailand. 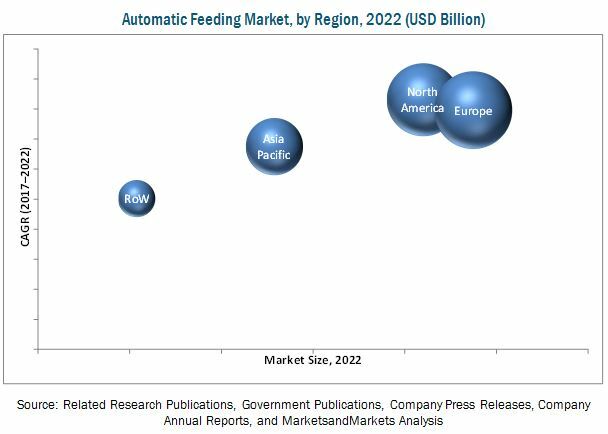 The global automatic feeding market is estimated at USD 4.37 Billion in 2017 and is projected to reach USD 6.30 Billion by 2022, growing at a CAGR of 7.5% during the forecast period. The primary factors that drive the automatic feeding market are increasing consumption of meat and dairy products and benefits of automation for farmers in the livestock industry. The increase in the number of consumers for meat and dairy products across the globe has led to an increased interest among the farmers to use automatic feeding equipment for livestock to reduce labor and increase the productivity of the animals due to precise and proper feed delivery on time. The major restraining factor for the market is the lack of standardization of automatic feeding systems. The automatic feeding market is segmented on the basis of feeding line, individual feeding equipment, livestock, feed, and region. On the basis of feeding line, the distributors segment dominated the global automatic feeding market, followed by the conveyors segment, in 2016. Two different types of equipment are used for distribution of feed among livestock rail-guided feed wagon and self-propelled feeder. Automatic feeding equipment help to provide feed at precise and regular intervals to animals. On the basis of individual feeding equipment, the equine feeder segment accounted for the largest market share in 2016. Famers are increasingly concerned about the health of animals as proper feed is required for the better development and growth of the animals. Automatic equine feeders are easy to use, save time, and offer accuracy. They also help farmers to feed horses and stags efficiently and improve the health of equine. The automatic feeding market, by livestock, is segmented into poultry, swine, equine, ruminants and fish. The ruminants segment accounted for the largest market share in 2016. Automatic feeding helps farmers to provide feed according to the requirements of the ruminants and helps to maintain a large herd. Ruminants are a source of milk and meat, and the quality of these products depends not only on the quality of the feed used but also on the efficiency and precision of the feeding process. The European region is projected to dominate the largest market share, followed by the North American region, through 2022. The North American region is projected to be the fastest-growing automatic feeding market during the forecast period. This is mainly due to farm owners and farmers in the North American region who are looking to boost the automatic feeding market to address the growing demand from consumers for dairy and meat products. This has resulted in the innovation of various automatic feeding equipment such as individual feeders and group feeders by various companies in the global market. High set up cost is one of the major restraining factors for the market. Feeding systems require high initial investments, efficient management tools, and skilled and knowledgeable farmers for uninterrupted and effective use. Most small & medium size farms do not have the capital required to invest in such automatic feeding equipment, thus restraining the growth of this market. AGCO Corporation (US) is likely to emerge as a leading market player in the automatic feeding market in the coming years, owing to its line of various automatic feeding equipment. The major players in automatic feeding market are AGCO Corporation (US), GEA (Germany), Delaval Holding (Sweden), Big Dutchman (US), and Kuhn (France).